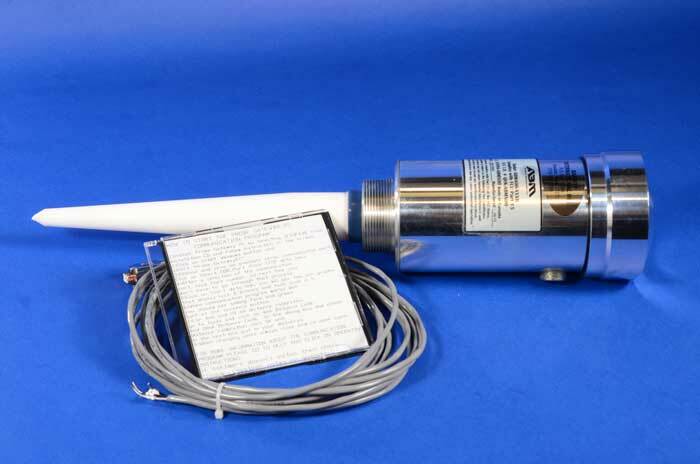 Babbitt ABM Series Radar level transmitters allow simple and reliable non-contact level measurement of fluids in a metal tank. The microprocessor-controlled electronics transmit a 6.3 GHz electromagnetic pulse down to the fluid's surface which is then reflected back to the antenna. The "round trip" time of flight is measured then calculated to determine the fluid level inside the container. Pulsed Radar units can "see through" environments such as foams, fumes and vapors that would normally interfere with ultrasonic type sensors. Babbitt ABM Series Radar units have a proprietary software that senses and analyzes the amplitude and shape of the received echoes. This enables the units automatic gain control to track the process level as well as eliminate false echoes from unwanted obstructions such as standpipes or tank walls. The dielectric constant of a material is important to the proper operation of Radar units. Each unit has the ability to work with materials that have a dielectric constant greater than 2. All Babbitt ABM Series Radars offer simple, single push-button calibration used to set the zero and span. Calibration can either be done in the vessel, on the bench or with the factory provided software. The calibration software enables diagnostics, data logging and access to special calibration features. 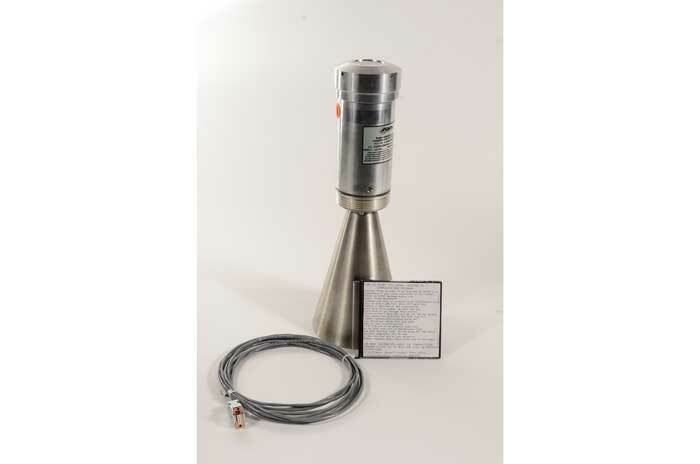 Babbitt offers Radar non-contact, continuous level transmitters in measuring ranges up to 240 feet with features to meet a variety of industries. Units are available in 4 Wire (115VAC), 3 Wire (24VDC) and 2 Wire Loop Power with HART 7 communication. Digital displays with optional set points for self-contained alarm and control functions is available from the factory. Explosion Proof (24VDC and 2 Wire Only), high temperature, high pressure and sanitary models with tri-clamp connections are also available. (See ordering instructions below) Proper installation and mounting is critical for consistent and reliable operations. 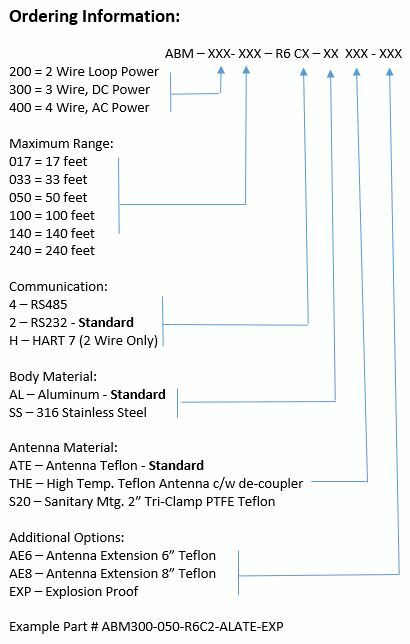 (See Installation and Mounting PDF below) For general questions regarding Radar units or unsure of whether a Radar is right for your application, please see our FAQ page.